GreenOn Program - Get a $100 rebate with a new smart thermostat installation in Niagara. GreenOn Thermostat Program - Niagara Contractor - KONKLE Plumbing and Heating Inc. Interested in the new GreenOn Thermostat Program? Smart thermostats do the leg work of keeping your home comfortable as efficiently as possible. They manage energy use in your home by learning your schedule and preferences, automatically delivering comfort when you're there and savings when you're not. Enjoy features like automated energy saving adjustments and maintenance alerts. Plus, with Wi-Fi technology, you control your thermostat from anywhere – on your phone, tablet, laptop or desktop computer. 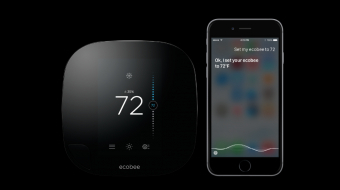 Starting December 13, 2017 purchase and install one of the qualifying smart thermostat models and receive a $100 rebate. Purchase and install one of the eligible smart thermostat models. Connect your smart thermostat to Wi-Fi then register your smart thermostat online with the manufacturer. Submit your rebate application through the manufacturer’s rebate portal:ecobee rebate or nest rebate. Your $100 rebate cheque will be sent to you in 8 to 12 weeks.